Mine action activities have made and continue to make a considerable strategic contribution to lasting peace in post-conflict situations. 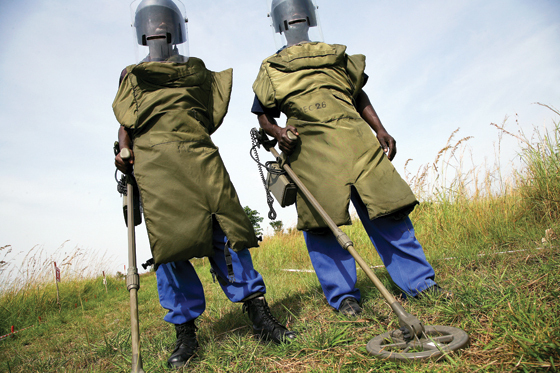 The United Nations Mine Action Service (UNMAS) was established in 1997 as the UN focal point for mine action through an amalgamation of the Department of Peacekeeping Operations (DPKO) Demining Unit and the Mine Clearance and Policy Unit (MCPU) of the Department of Humanitarian Affairs (DHA). UNMAS is now located in DPKO’s Office of Rule of Law and Security Institutions. Last year over 200,000 landmines were cleared around the world. In Afghanistan alone, over 81,000 anti-personnel mines were removed during 2008 by over 8,000 national staff. Meanwhile, to date in Sudan, collective efforts have opened over 29,000 kilometres of road thereby increasing freedom of movement, reclaiming productive land and reviving trade. However, there are still formidable challenges: landmines continue to kill and injure every year, they hinder social and economic development, and represent a serious obstacle for humanitarian operations throughout the world. The United Nations Mine Action Service will continue to work with agility and determination until we put ourselves out of business. But, until this happens the mine action sector will continue to navigate new terrain, adjust to new ideas and remain vigilant to face the challenge of changing methods of warfare. To achieve our goal of zero new victims of landmines, two key areas must be targeted: the ownership of national governments to mine action operations and the strength of the partnerships they build with a variety of partners, including donors, practitioners – in particular non-governmental organizations (NGOs) – humanitarian agencies and the local communities themselves. The United Nations plays an important catalytic role in the coordination of global mine action efforts. I am convinced that mine action operations, particularly those which are nationally managed and run, build confidence among the population and government in the peacekeeping context, and foster further programmes and successes in the rebuilding of post-conflict states. Mine action is ultimately the responsibility of individual national governments and authorities. It must therefore be integrated into national reconstruction and development plans at the earliest opportunity. In countries affected by landmines and explosive remnants of war, mine action is a necessary precursor to post-conflict reconstruction and development. This is also why transitioning United Nations led operations into sustainable national operations is a critical element of our work. Building local ownership into mine action operations is a continuing challenge, which is why the transition to national ownership is a key component of the United Nations inter-agency mine action strategy for 2006-2010. We have had success in Croatia and Afghanistan and are currently in the process of transition in Sudan. This national ownership is an essential element of mine action. Without this ownership the sustainability of a mine action operation will be jeopardized and its impact at the community level will risk being ephemeral. Mine Action Coordination Centres are frequently initiated and developed under the direct auspices of local authorities. Our role at the United Nations is to provide them with the assistance they need and to support international cooperation. Strengthening local capacity will ensure the sustainability of the operations at the national level. Local NGOs have proven time and again how vital they are to mine action efforts in countries such as Afghanistan, Sudan and the Democratic Republic of the Congo.The United Nations could not presume to achieve a forward agenda without the partnership of all those in the broader international community. After all, it was civil society and forward-thinking countries such as Canada and Norway that led the way to the Ottawa Convention. Nongovernmental organizations and mine-affected countries themselves are doing much of the work and will continue shouldering the bulk of the responsibility for achieving a mine-free world. Although we have a vision for what the future should look like and a plan for doing our own part to get there, we rely on all of them to lead the way. The strength of these partnerships at the national level also creates a solid foundation for our work at coordinating the global response to mine action. Over the past 12 years, UNMAS has managed unprecedented inter-agency coordination through the Inter-Agency Coordination Group for Mine Action (IACG-MA). In 1998, the General Assembly welcomed the establishment of the United Nations Mine Action Service (UNMAS) in its role as system-wide focal point and “its ongoing coordination with and coordination of all mine-related activities of United Nations agencies, funds, and programmes.” That endorsement has been consistently reiterated in subsequent resolutions. In one of the first major tasks as focal point, UNMAS coordinated the development of the 2005 “Mine Action and Effective Coordination – The United Nations Inter-Agency Policy” which was intended to provide overarching policy guidance and to delineate responsibilities amongst the 14 UN departments, agencies, funds and programmes which are involved in the sector. It also identified five key pillars within mine action: advocacy, mine risk education, stockpile destruction, victim assistance and mine clearance. This policy was subsequently updated in 2005. UNMAS has also coordinated the development of two 5 year strategies covering the periods 2001-2005 and 2006-2010. The United Nations has been involved in humanitarian mine action since the establishment of the mine action operation for Afghanistan in 1989. In the early 1990’s, mine action activities were an integral component of UN Peacekeeping Operations in Cambodia, Angola, Bosnia, and Mozambique. During this time, the scale of the global landmine threat was recognized by a number of like-minded countries and a broad coalition of civil society actors which formed the International Campaign to Ban Landmines (ICBL). This resulted in the adoption of the landmark Anti-personnel Mine Ban Treaty (APMBT) in 1997, ICBL’s nomination for the Nobel Peace Prize, and successfully transformed the landscape in which UNMAS operates. 2009 marks the 10th anniversary of the APMBT and will require targeted advocacy efforts to ensure the Treaty’s further implementation. In addition to dealing with the anti-personnel problem, UNMAS operations also address the threat posed by anti-vehicle mines and other explosive remnants of war (ERW), and addressing the needs of survivors who will need assistance long after clearance has been completed. Since 2002, UNMAS has lobbied intensively for legally binding instruments that address these issues to be developed within the Convention on Certain Conventional Weapons (CCW). Some success has been achieved, with Protocol V to the CCW on ERW which entered into force in 2006. More recently, 98 countries signed and ten of these ratified the new Cluster Munitions Convention (CMC), which opened for signature in Oslo on 3 December 2008. The Convention, which prohibits all use, stockpiling, production and transfer of cluster munitions and further addresses topics like assistance to victims, clearance of contaminated areas and destruction of stockpiles, will enter into force after it has been ratified by 30 countries. As the DPKO focal point for the Inter-Agency Standing Group (IASG) on the Convention of the Rights of Persons with Disabilities (CRPD), UNMAS closely followed the entering into force of the Convention on 3 May 2008 and is starting to integrate it in its work at headquarters and in the field. These new instruments will reinforce the overarching legal framework under which UNMAS operates. In recent years, there has been a dramatic increase in the number of DPKO and Department of Political Affairs (DPA) led operations that have included mine action components as either specified or implied tasks within the mandate. UNMAS currently provides direct support and assistance to ten Peacekeeping Missions, and technical advice to a further four. In these operations, UNMAS is dealing with the full gamut of mine action activities, including assistance to countries with legacy problems from long-term conflict situations (e.g. Afghanistan, Western Sahara, Sudan), the implementation of victim assistance programmes (e.g. Sudan), the destruction of ammunition stockpiles and caches (e.g. Afghanistan, Democratic Republic of Congo), the clearance of routes and other essential infrastructure (e.g. Sudan, Darfur, Democratic Republic of Congo) large-scale ERW contamination (e.g. Lebanon, Chad, Western Sahara) and destruction of explosive remnants of war as an essential element of a peace settlement (Nepal). These examples highlight the range of activities and the number of players involved in the mine action sector. They also underscore the fact that coordination is a prerequisite to the effective implementation of mine action operations at the country level. As mine action moves forward, opportunities present themselves to enhance the role UNMAS and its partners can play in supporting existing processes as well as emerging issues that are of concern to the mine action community. UNMAS will continue to hone its strategies and programmes to maximize the impact of its work. UNMAS will improve its integration both within and beyond the Department of Peacekeeping Operations. We will also facilitate the development of a coherent inter-agency policy on transitioning mine action operations to national ownership. Each of these elements will play a key role in advancing our vision of a world where individuals and communities live in a safe environment conducive to development, where the needs of victims are met and where survivors are fully integrated into their societies. My line of work is one that all too infrequently makes the evening news headlines. But, it is work that is essential to the daily lives of millions of people around the world who – because of our efforts to remove landmines and explosive remnants of war – can safely walk their children to school in Kabul, Afghanistan or transport their crops to markets on landmine free roads in El Fasher, Sudan.The events of the last two decades have not resolved, but sharpened, the challenges for mine action operations. These are global challenges. Millions of people in nearly 80 countries still live in daily fear of landmines and explosive remnants of war. As the worldwide mine action community evolves to address the continued challenges posed by these munitions, UNMAS will respond with appropriate alacrity. The active participation and support of national authorities and local and international NGOs is the only way to truly attain the goal of zero new landmine victims. This is a global challenge that demands a global response that is agreed and coordinated through this most universal of institutions, the United Nations. * Maxwell Kerley is UNMAS Director. 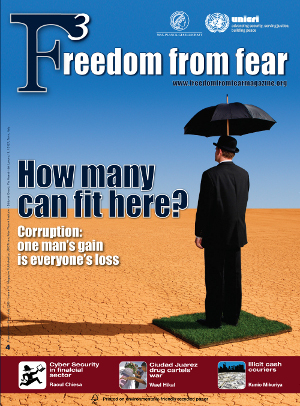 The full version of the article was originally published in the UN Chronicle Issue 1 and 2 in 2009.